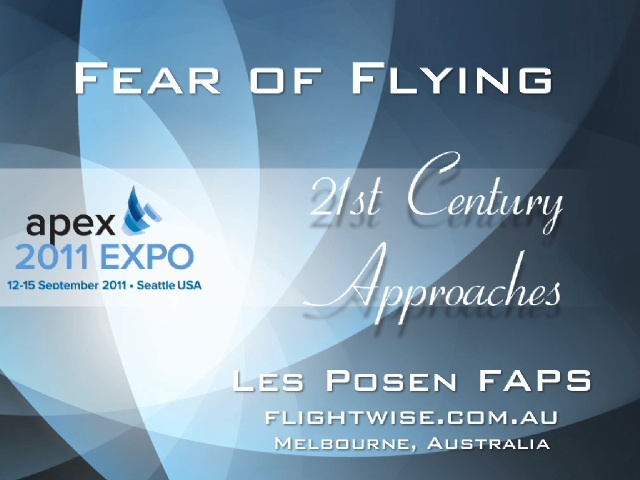 I’m in Seattle, Washington currently, where I presented today at the Airline Passenger Experience Convention – APEX. You can see how my talk was described on the website here. As I expected, mine was the only Mac being used to present, everyone else having to upload or bring along their PowerPoint slides to be placed on the PC laptop at the lectern. I came 90% prepared for this, and the night before my presentation, scoped out the room where I was presenting for size, layout, screen and other A/V equipment. In the morning, I finished my slides (I had been waiting for a co-presenter’s slides to arrive – he didn’t attend at the last moment due to illness) and headed over to see how others were presenting. Would it be steeped in PowerPoint with all its usual faults, or because of the conference’s raison d’être – the customer experience – would it be more Keynote-like? Suffice to say mine was the only Mac used to deliver a presentation, thus the only Keynote on show, and the rest you can guess with a few exceptions. I missed the presentations from Airbus and Boeing in the morning (but that’s not what I came for) but will catch up with them another time. I heard they were terrific. But what I did see – great for a gadget head like me, since it was very much about IFE (Inflight Entertainment) – was standard aviation powerpoint: text too small, diagrams better suited for a handout to be read at close range in your own time rather than from the back of a cavernous hall, images with copyright labels still on the them (e.g. Getty Images), and too many small pictures on a single slide. So for me the bar was rather low to leap over. BUT – as engaging as my presentation was, the content was perhaps too challenging for this group which wishes to focus on products that will enhance the customer’s experience. Fear of flying is not a fun topic, and is in fact – like comparing the relative safety of airlines – an “undiscussable” in this context. I had that feeling in my gut, so decided that since I wasn’t there to sell a product as such, I could throw caution to the wind and go the full entertainment experience, setting myself a challenge to make what can be a dour topic which is to close to the bone for some in aviation, into an interesting and engaging half hour presentation. Keynote can’t do that for you of course, but it can elicit ways of thinking about a topic, and thus conveying your knowledge, authority and authenticity, presenter qualities I have written of previously here. I choose to do these talks to stretch myself as a presenter. While I live and breathe free of flying most days of the week with patients, I don’t present on it at aviation-based conferences. So, it was a multiple challenge, including the 20 hour plane trip the day before (for the aviation buffs: UA840/870/820 – MEL/SYD/SFO/SEA). And unlike recent workshops I have done, I didn’t start with a master slide deck to then tweek for a designated presenter group. I had to design this deck from scratch, think about a different audience than my usual, reckoning on their dependency on the cognitive style of PowerPoint, and put together fifteen years of professional endeavour into thirty minutes. I didn’t finish the presentation until the morning of the conference. I really had to think in very narrative terms, which I’ll explore with you in a blog entry to come. Perhaps inspired by the Leonardo DiCaprio movie, Catch Me If You Can, this new series which starts September 25 in the US (soon after that on Bit Torrent 😉 was exactly what I wanted to include in my presentation with respect to how flying has changed over the last several decades, and how its timing is perfectly suited for those nostalgic for more pleasant flying experiences, now something a thing of the past, due to 9/11, GFC and the rise of budget airlines. Because I was short of time, I decided not to fire up Screenflow to record the promo on the ABC site, guessing it may appear on the ABC official YouTube page. And indeed there were several promos there which I duly downloaded using a Firefox plugin to get it in reasonable mp4 format. As it turned out, Keynote coughed it up like a fur ball, looking for some kind of reference file, the sort of thing I expect of Powerpoint. Converting the mp4 into a .mov file using Quicktime Pro 7 solved that problem. It went down a treat in my presentation, fitting in well with the narrative. Here I am pictured with them. I’m not tall at 5’9″ but I’m no shrimp either. For the presenters amongst you, I was most fortunate to be the first of the speakers for the 4pm session. There was a coffeebreak at 330pm so I had 30 minutes to get my Macbook Pro hooked up with the aid of the specialist A/V staff, test the projector for colours (it was great), and indeed I could have used my HDMI adaptor and cable thus making the transition back to the PC much easier by the projector’s remote switching rather than unplugging/replugging VGA cables and holding up the others’ presentations. Had I been the session’s second or third speaker, I would have rushed back to the Hyatt, grabbed my HDMI cable during the break, and hooked it up ready to go when it was my turn. The thirty minute break allowed me to test my Keyspan remote, and lavelier microphone since I was following my usual presentation style of not standing on a dais behind a lectern. I got my iPad/iKlip/Doceri remote software operating using the Seattle Convention Center’s free wifi. You can see a picture of the setup below. The Doceri app is here hunting for the connection to my Mac which is showing the first slide in mirror mode, soon to switch to Presenter Mode. I started at a few minutes past the hour and all went well until the Pan Am video began. I heard the familiar Mac alarm beep, and discovered the Keynote app had left the show and gone into working mode, i.e. bare naked, one of the worst presentation sins where the audience sees your slides naked and their sense of immersion in your story is lost. It’s just as well I was in Presenter Mode such that only I saw Keynote this way. The audience saw the secondary display desktop view. Now ordinarily this would be the default blue constellation Lion desktop. Itself not too bad, but a little jarring nonetheless. Presenting in a new venue with unfamiliar, untested setups can be very testing of one’s faith in technology, especially given the gnashing of teeth regarding the latest versions of Keynote and Lion being so problematical for people to either downgrade to Snow Leopard or go back to Powerpoint to get the work done. Desperation indeed! So while in rehearsal for both timing and practice, all had worked without a problem. I knew this presentation was one that really counted and so needed contingency plans. I knew I could do the talk without slides, confident in my ability to create a “theatre of the mind” experience. And that while I really wanted to display my prowess with Keynote, all would not be lost on this crowd who were so steeped in Powerpoint that a good oral story telling would work fine. So I also added something new to my kit which I learnt from fellow presenter Kerrie Mullins-Gunst at a MUG meeting recently. She took her first slide, called the poster slide, and made it her desktop picture for the secondary display. You do this when your Mac is in span mode, not mirror mode, otherwise only the Mac gets the poster for its desktop picture, and the secondary display stays with the default blue constellation. When in span mode, two pref screens open up, one for the Mac and one for the second display screen and you choose just the one for this screen. So when I dropped out of my presentation accidentally, my poster slide, below, with the APEX-supplied theme I was compelled to use (supposedly throughout the presentation, but once was enough), was on display, which is the best outcome possible in the circumstances. The reason Keynote dropped out was due to the A/V technician not connecting my power supply properly and me not double-checking my setup. When battery power becomes too low, Keynote cleverly drops out, issues a warning message and sound, and gives you an opportunity to power up in a few seconds, which is what I did, cracking a joke at the same time. What else is there to do at such a moment? This outcome is better than allowing the Mac to be completely drained then have to wait until it powers up, perhaps even needing to be rebooted. There goes several valuable minutes. If you’re really tight for time, and such an event would be fatal to your presentation, your best bet besides having a second Mac ready to go (such as at Apple keynotes) is to put your presentation onto your iPad or even iPhone, modified so it works properly, being careful of how movies make the transition from desktop to iDevice. After your Mac boots up again, you have to keep your talk going on the iPad while you get Keynote fired up and locate the current slide. Not exactly seamless, but the best of a difficult situation. The same thing can happen by the way if Keynote begins any recalcitrant beach ball behaviour suggesting it’s frozen or doing a lot of thinking! In the end, things worked fine, no movies froze or stuttered, the Magic Move transition was well-used (especially for showing publications in detail – a blog entry for another time) and people had a good time staying engaged even after a full day of heavy duty Powerpoint. Doceri continues to impress and while I haven’t yet found a way to use annotations on a slide, preferring to plan my callouts ahead of time, I’m confident the Doceri developers will now keep presenters more in mind, in addition to their main focus on educators. 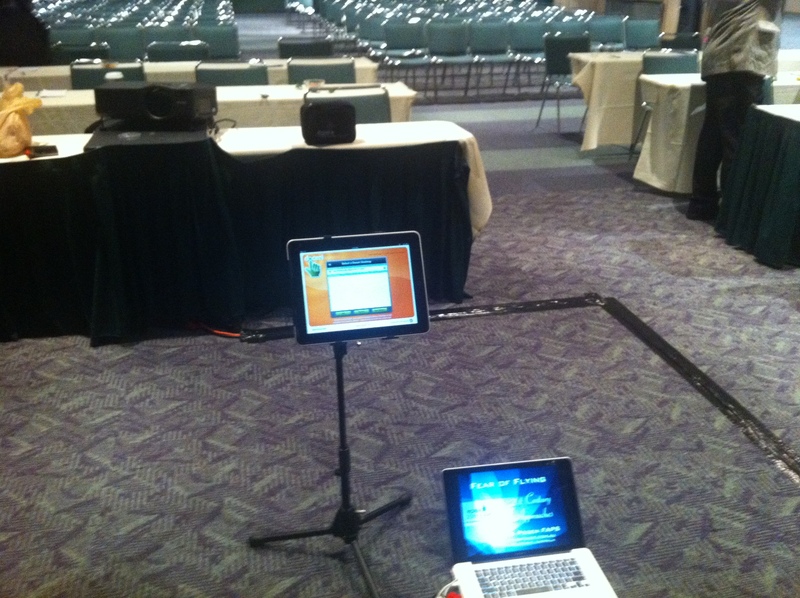 The convention I presented at had two streams. One, a day of presentations by key players in the passenger experience arena, such as Boeing and Airbus there to discuss cabin design philosophy through to OEMs supplying onboard screens and entertainment systems. This included movie houses like Time Warner, Disney, and National Geographic who supply content to be viewed on the hardware. The second stream was break-out sessions where small players could talk about their software, hardware or research outcomes in the field of IFE. This is where my Fear of Flying session was slotted in. 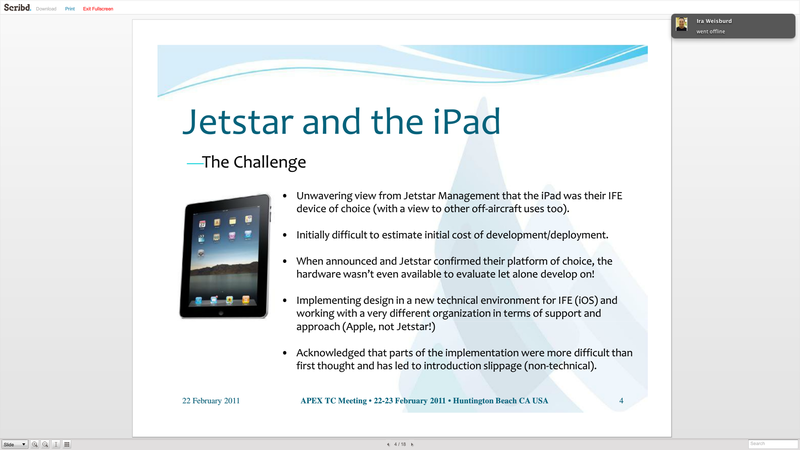 I discussed towards the end the use of iDevices supplied by airlines, or with content downloadable from their websites or iTunes to passengers’ devices which could contain information andy techniques for being a better flyer (implying its utility to fearful flyers). I should also note that there is a three day show floor expo where IFE suppliers can demo their wares, usually in appointment booths. I didn’t see it, but the very tall and delightful Mary Kirby (see her in action here) told me in discussion of a firm using a Samsung tablet to develop a tray table tablet called TrayVu. 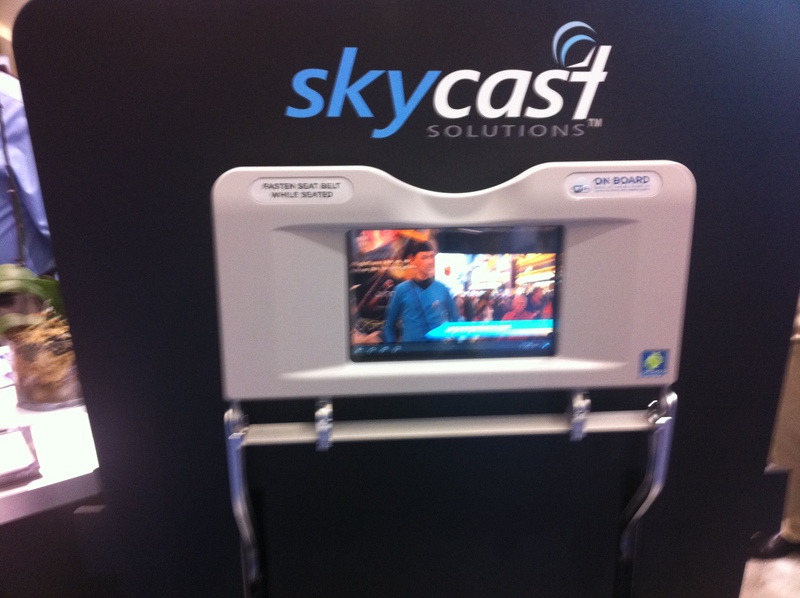 You can read the Flightglobal story and the very confident CMO of the firm designing the device, SkyCast, here. The CMO, Greg Latimer is quoted as saying “It’s an Android world.” Others whom I saw presenting would disagree harshly suggesting it’s indeed going to be an iPad world in planes. 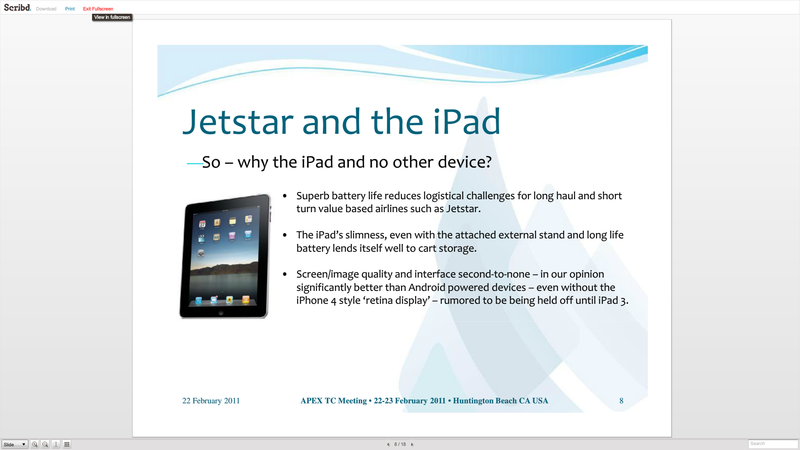 In my own presentation, I referred to a trial of specially-modded iPads under consideration by Australian budget carrier, JetStar. Placing the iPad in a special case to give it twice the battery life, and using proprietary apps, the plan appears to be to rent the units with chosen content to passengers. 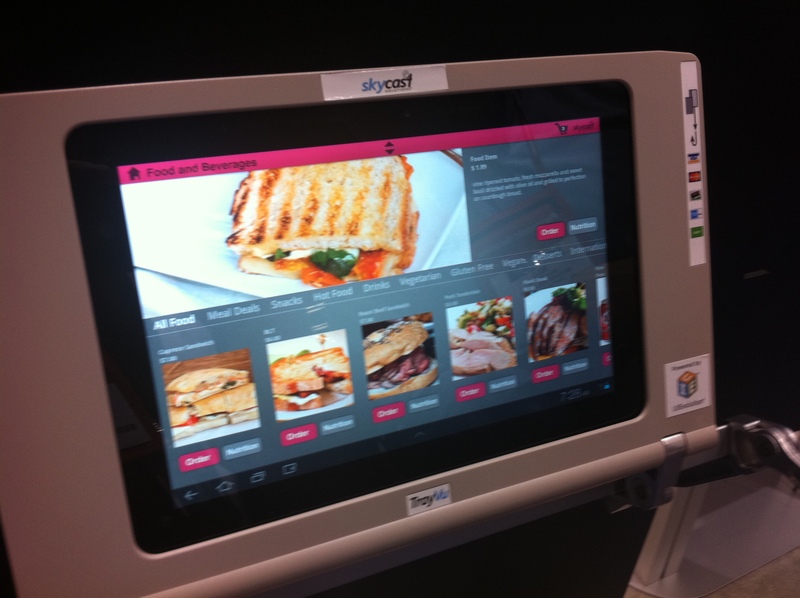 The kits would also come with RFID tags to prevent passengers walking off the planes with the iPads. I located previous APEX slides from the teams putting this together for JetStar and used them as discussion points for how technology could be put to good use for the better flyer. (After my talk I was introduced to the President of APEX who works for Emirates who told me that after installing cameras in their planes for passengers to see takeoffs and cockpit views, their impression was that it was very helpful to fearful flyers. We then reminisced of times one could visit the flight crew mid-flight until the events of 9/11 put a permanent stop to that delight. It seemed to me with my limited exposure to this world of inflight entertainment, other than as a consumer, aviation consultant and now APEX attendee and speaker, that the IFE world is fracturing. Just like old world media fighting a rear guard action against new means of publishing and accessing content, the old guard in IFE where the airline controlled what you saw and how it was displayed is disintegrating. One of the co-founders of a new web-based startup, MondowWindow.com, whose content is accessed on iDevices on wifi equipped aircraft – another big discussion development at APEX – spoke of how Clayton Christenson’s concept of Disruptive Innovation was now entering the world of IFE. New players such as his Mondowindow would take now-familiar technologies such as iPads, and repurpose them in environments previously “owned” by incumbents with many years of technical prowess, leadership and trust in aviation. 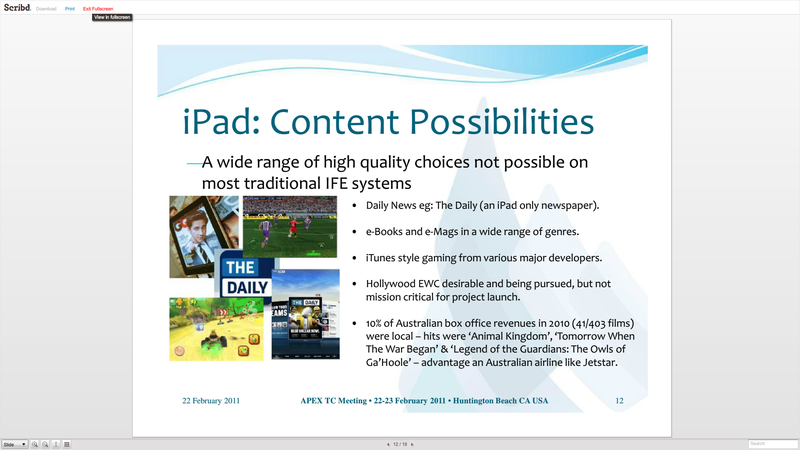 It was his strong assertion that the IFE world is about to be turned on its head by the iPad in particular given its 85% market share for this device, and this will perhaps climb with iPad 3. 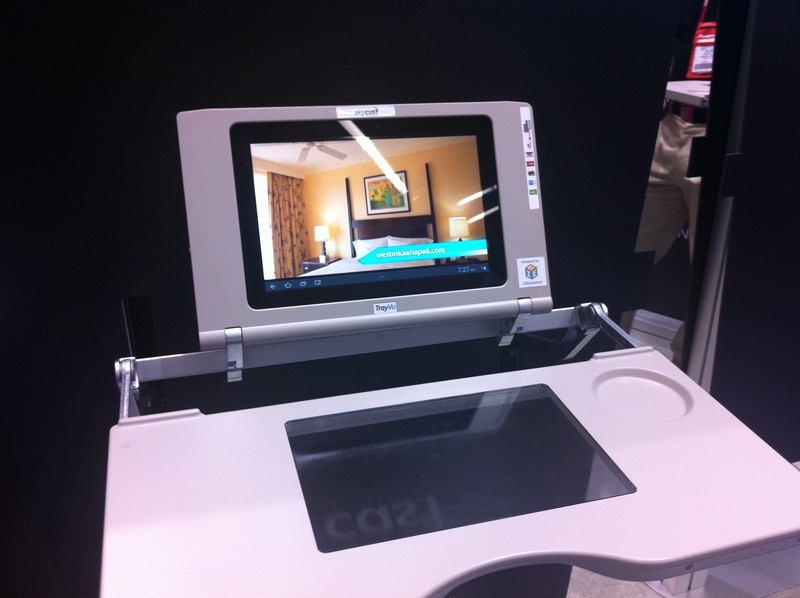 IFE takes years to develop, install, then make deals with content providers for the airline industry and by the time seatback hardware and systems are installed, iPad-like devices have leapt ahead another generation. With wifi taking off big time now after a false start some years ago, and compression protocols vastly improved, it’s now possible for airlines to consider entering into deals with wifi providers like GoGo who are embarking on a plan to provide streaming content, Hulu-like, rather than plain vanilla wifi. Go here to see Mary Kirby talking with one of the Gogo team. 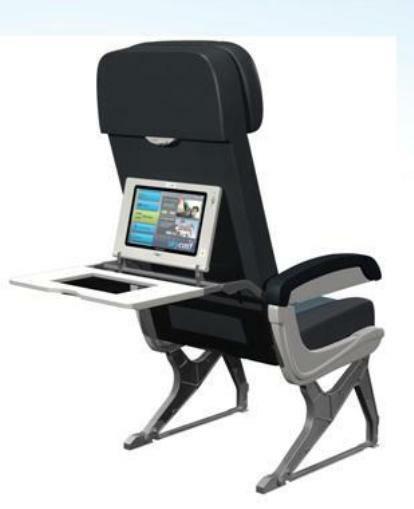 So the way things are moving along, it seems like the incumbents like Panasonic and Thales who provide the hardware, need to look at how the low cost airlines are avoiding them, preferring to purchase iPads with chosen content as in the Jetstar model, or equip their flights with robust wifi and take a cut from suppliers like GoGo. Interestingly, over a lunch sponsored by GoGo, I sat with one of their team quite by accident, surrounded by Australian attendees from Qantas and VAustralia. We discussed my forthcoming presentation, and I explained to him how GoGo too could develop content for better flying and on-sell it to airlines, together with the usual fare like movies and TV shows. At one point he asked about fear of flying and if crews should give passengers advanced warning of impending turbulence. At the time of his asking, I didn’t think much of it, as even commercial pilots have asked me if they should not announce likely bumps thus minimising unnecessary worry (since turbulence is uncomfortable but not unsafe – which is what they should say). If you announce it before, and the worrying passenger doesn’t know what to do about it, it doesn’t help. But as our conversation expanded, I came to understand the relevance of his question. Apparently, GoGo is developing an app for the iPhone which takes advantage of its accelerometers. Put your thinking caps on: what does this mean in the context of our discussion? Well, if you have a plane full of iPhone users or perhaps just a critical number, and the plane experiences turbulence, it will register on those accelerometers. Logged into the Gogo wifi, it will feedback to GoGo the data which can then be shared with other Gogo users on a similar heading or the same vicinity. Passengers will get information about their flying conditions before the FAA and their own flight crew do! We then discussed how the iPad’s success had caught many industries unawares, (“perhaps even Apple itself” was my contribution) and agreed no one knows where things will next move in the next few months when the iPad 3 is released. The GoGo guy lamented their streaming efforts would be restricted to Android devices until they can work out how to overcome the 30% impost Apple employs in its iTunes store. Much like how Amazon’s Kindle app is now a mere portal to read downloaded content and access the Amazon website, rather than a sell through app, GoGo faces a similar hurdle and a 30% “tax” means goodbye profit. Forcing people to go to a website to download content once they’ve become used to the iTunes model is anathema, putting too many hurdles in the way for the average user. It’s been a fascinating, rather risky visit, coming to APEX totally unknown but with an interesting story to tell, and hopefully the session evaluations will bear out it was a good decision to have me speak. it has certainly opened my eyes to a world in which I spend time on the periphery, yet it has also empowered me to explore other airline opportunities with some of the people I’ve met here. The airline industry is rather addictive in nature: very family oriented, a curious mix of cutting edge technologies and very human interaction, people who leave it for various reasons often are drawn back to it in time. Tomorrow, a visit to the Boeing factory, a first ever look at the new 787 and 747-800 and their facilities, and then a visit Friday to my old chum Dr. Kim Silverman, from Apple. Here’s his talk at San Jose TEDx earlier this year.